Okay - an new painting in progress! Here we go. First I worked on the drawing. After getting it composed the way I wanted it, I transferred the drawing to my 300 lb. Kilimanjaro watercolor paper with graphite and a tracing method. This piece is on a full sheet so it measures approximately 20 x 29, after taping the edges to a foam core stabilizing board. This prevents the paper from buckling while I am working on the piece. 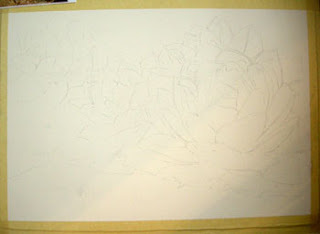 Oddly enough, I will begin this painting starting with the darks. This is unusual for a watercolor painting, I know, but this helps me to navigate later when the painting seems more complex and my pencil lines become lifted into the wet pigment and disappear. I wanted to get the shadow shapes established in this piece. 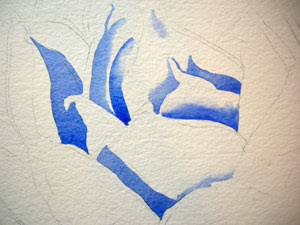 I worked over the entire painting with French Ultramarine Blue, building the shadow areas with crisp and soft edges. I can't stress enough how important WATER is to this process. Paint wet. That is all there is to it. If you don't have enough water in your pigment mixture the paint won't flow, and it won't glow with color. To soften an edge I apply a very wet area of pigment, then I clean my brush and while the pigment is still wet, I pull water into the pigment area from the white, unpainted area. Each stroke I make with a clean, damp brush. If I pull from the pigment area into the white area, I will just pull color and dilute the mixture that is already applied, and the color will move right out to the edge of the stroke. If I pull FROM the white area with water INTO the color, the plain, clean water at the edge will dry leaving no water mark or line. This makes the light to dark transition very smooth and soft with no funny edge. It works well for me. More to come! Check back as I record my progress on this piece.